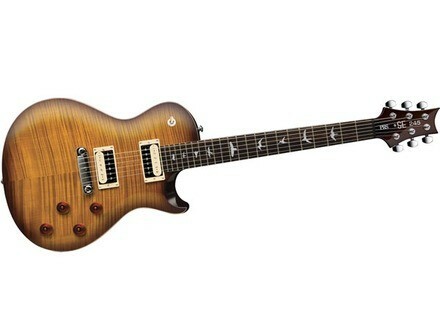 SE 245 - Tobacco Sunburst, LP-Shaped Guitar from PRS belonging to the SE 245 model. King Loudness's review"Great budget PRS"
The PRS SE245 is basically an SE version (made overseas) of their ever popular SC245 model. Many of the specs are the same, but it doesn't have the price tag of the original model. This particular guitar has a mahogany body with a flamed maple top, a mahogany neck with a rosewood fretboard and 22 frets, the trademark PRS bird inlays, classic PRS wraparound bridge/tailpiece, and a pair of PRS designed humbuckers. It also offers a 24.75 scale length to go that extra mile. 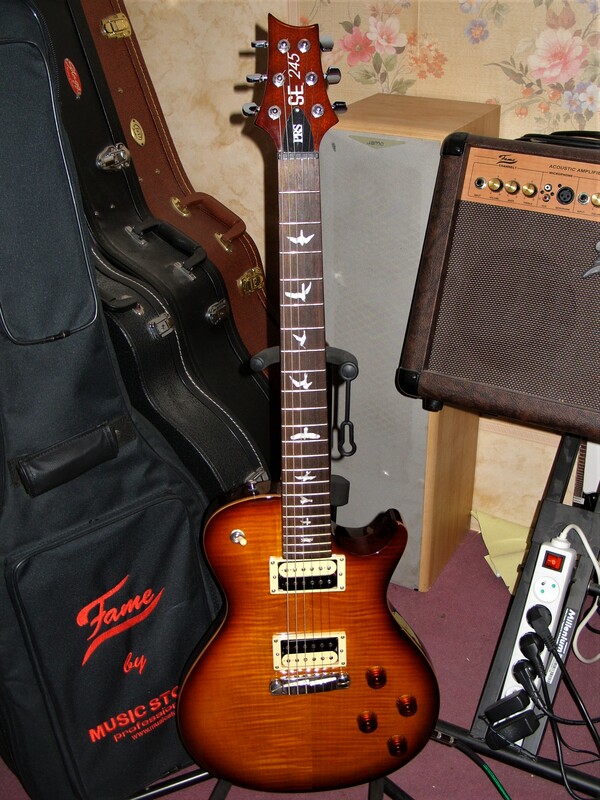 It's loaded with the PRS SC245 control layout of two volume controls and two tone controls with a 3 way selector switch. The design of this guitar is fairly ergonomic considering that it's a mahogany guitar built in the general style of the classic Gibson Les Paul. The guitar sits well on the body due due to its reasonable weight which is definitely a great thing for any players of this type of guitar. The neck heel is molded differently than a standard Gibson and to me I can attain greater upper fret access with this design. The singlecut shape isn't the greatest guitar for playing uber fast on, but the PRS doesn't make things difficult by any means - it's quite a treat to play. Getting a good tone out of this guitar is pretty easy. Despite being an SE model PRS, it still sounds great. Picking it up and strumming it unplugged yields a very full and rich tone that is only bettered when the guitar is plugged into a good tube amplifier such as a Fender, Mesa Boogie or Dr. Z.
I've tried this guitar through various different amplifiers and have been fairly impressed each time. The PRS designed pickups in this guitar are very nice and articulate, just the same as the pickups in the real SC245, and it definitely sounds wonderful for a whole host of styles. The clean sounds have a great complex sparkle that lends itself very well to clean tones using effects or to the heaviest of distorted tones a-la Porcupine Tree where clarity is of maximum importance. I've always liked the SE pickups and this guitar does not disappoint. There is a great vintage snarl to this guitar, with a lot of killer harmonics lurking inside for distorted work. Heavy rhythms are just awesome with this guitar, and it sings for fusiony lead work too. Though the pickups seem vintage at first, they can certainly handle modern tones quite well too. All in all I think the PRS SE245 is a great guitar that is an excellent version of the famed PRS singlecut for those on a budget or who are apprehensive about buying a PRS for $2,000. Though its made overseas, it still is an extremely high quality instrument and it has the cosmetics and tone that are close enough to a real PRS to maybe even fool someone. For the sub $1,000 price bracket that these sell for new, it's really a no brainer if you want to get a guitar that has the PRS vibe for not a lot of cash. 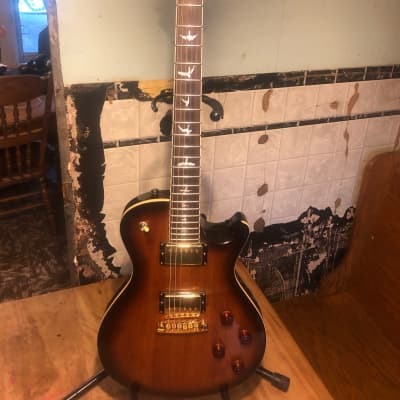 tjon901's review"Classy Singlecut SE model with a super short neck"
The PRS SE line of guitars is their line of guitars that is made overseas. They are much cheaper and usually have very simple finishes. This guitar breaks this image by being low cost but having an awesome top and finish to go along with it. 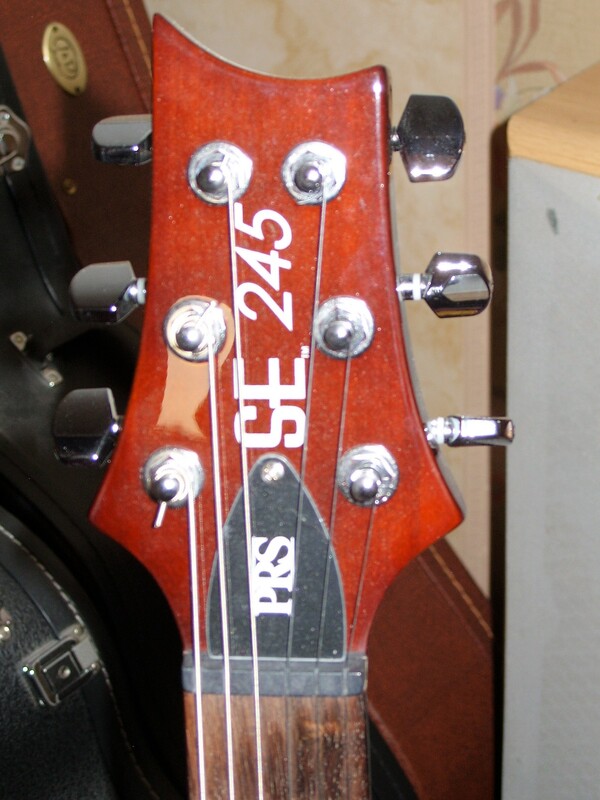 This is the PRS SE 245 model. This SE model is targeted at more traditional single cut or Les Paul players. The guitar has a mahogany body with a maple top and flame maple veneer. The set neck is mahogany as well with a rosewood fretboard. 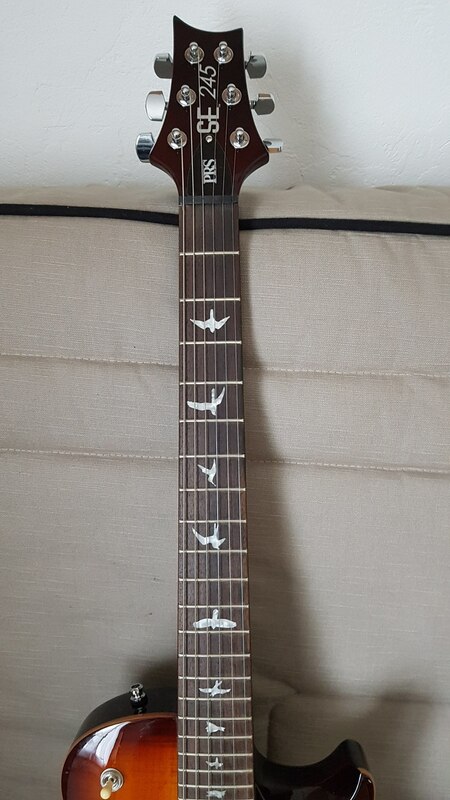 The fretboard has 22 frets and has the cool PRS bird inlays. Since this is targeted towards traditional Les Paul players it has a 24.5 inch scale lenght which is where the name comes from. The neck is PRS's wide fat profile. It has standard PRS SE zebra bobbin pickups front and rear and a PRS wrap around bridge. 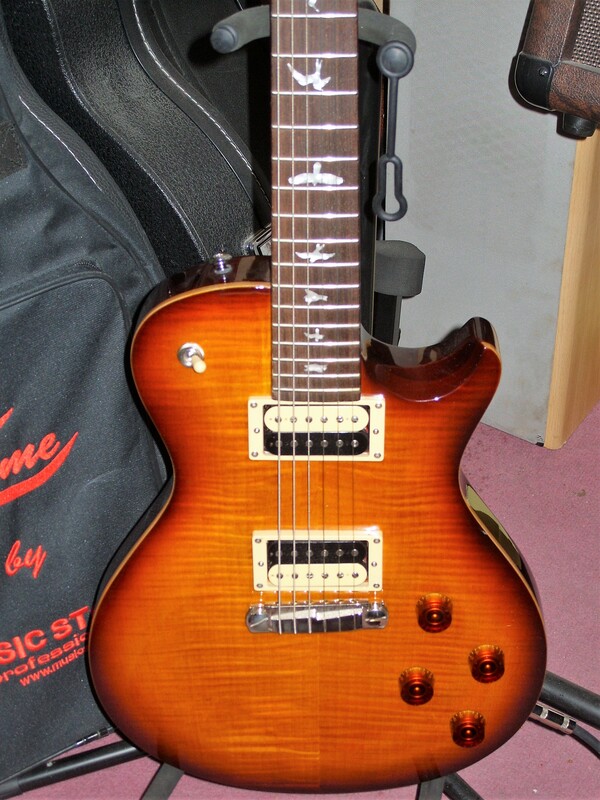 It has Les Paul controls with a volume and tone for each pickup and a 3 way switch on the upper bout. This guitar has a unique feel to it compared to other PRS guitars. It has a super short scale even shorter than a Gibson. I found this pretty weird. It is easy to play above like the 15th fret but beyond that it gets way too crowded for my fingers. I dont know why they didnt just give it a 24.75 scale lenght. Maybe they already had the 245 name made up and 2475 was too long. PRS wraparound bridges actually intonate pretty well. You cant adjust it but if you stay in normal tunings they do their job well. This guitar has more of a vintage tone. The pickups seem to be a medium output. With the short scale on this guitar everything is a bit muddy. The string tension isnt really there so you will have to fight the guitar for a bit of clarity. This problem helps the neck position thought. The neck pickup tone is unbelievably smooth because of the short scale and pickups. If you were just playing blues and jazz this guitar would be perfect for you. This is what the guitar does best with the short scale and vintage voiced pickups. The bridge pickup sounds a bit nasal in the clean setting. It has decent spank to it with a bit of overdrive. I would probably swap out these pickups if this were my guitar to keep. Something hotter with more clarity would work well. This guitar seems to be meant for super traditional Les Paul players. It pretty much provides good tone under clean or barely overdriven settings. The short scale and and super low output pickups give this guitar an antiquated feel which some people may like. It is very comfortable to play on the lower frets because of the short scale but this makes the high frets very crowded and awkward to play on. I would have a hard time recommending this guitar to most people. It is a Les Paul type guitar! I play mainly Heavy Rock US-style Alter Bridge, Nickelback, Creed, and I must admit that the microphone has a great versatility of the time that the metal tape not violent and hairy (that is not the EMG ^ ^). I should point out that with wha pedal (ibanez DW7) the sound and really fun and a little funk rhythms are a real treat = P.
Bridge pickup: cold, precise, with good definition in its full. I play this guitar for 3 months now and I must say that pleasure is always present. My test may not be very accurate but all is not just that I tried a lot of guitar before it. She really has a look to die for, whether for the table (tobacco sunburst) or "birds" on the handle. The value for money is more than adequate in my opinion and the addition of high-end micro PRS (which I intend to do next with the Tremonti pickups) can embellish the already excellent sound of the beast. I would definitely do it again this choice (in scarlet red). Ps: let me change my test if I discover new qualities or fault this guitar. so stay tuned!